Well, day one of Dustin going back to work went ok. Brady didn't nap so he was not so fun to be around in the afternoon. Needless to say, I was very excited for Dustin to come home. We'll see how day two goes. 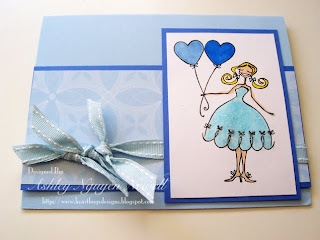 Here's a card I made this past weekend for the featured stamper challenge on SCS. HERE is the card I CASEd from Theresa. I changed the colors, stamp set, and the size of the main image. I gave my pretty Balloonabella a sparkly blue dress with Baby Blue Stickles. The designer paper and the ribbon are both Stampin Up. Alright, off to see if I can catch a few more winks before my big boy wakes up. Happy Thursday everyone! This is very Cinderella!!! Gorgeous! Beautiful! Love all the blues! And the way you colored Bella and her baloons! Hope your day 2 goes well! Precious! I hope you had an easy day two!